The 40-yard dash is the main event of the NFL Draft Combine, and the one test than can make or break the pre-draft process for receivers, cornerbacks and running backs. A fast time can make an unknown player draftable, while a slow time can turn even a college star into a mid-round straggler. No test during the combine will be more closely watched than the 40-yard dash, and no results more intensely discussed. But 40-yard times still carry weight. Last March, Bishops University slotback Steven Turner blazed a record 4.31-second 40 at the CFL evaluation camp, fast enough to earn him an invite to the Chicago Bears’ mini camp. The only player with a faster pre-draft 40 than Turner’s was current Oakland Raider Jacoby Ford, whose 4.28 topped the NFL combine. 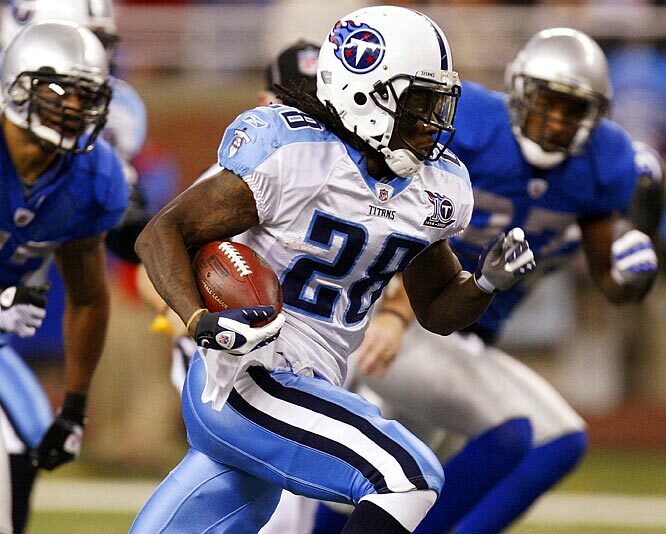 And even a world-class sprinter like Ford couldn’t match Titans tailback Chris Johnson, whose 4.24 at the 2008 combine prompted speculation that he was the fastest man alive. But are any of these guys as fast as their 40-yard dash times indicate? A closer look at the numbers raises questions. At the 2008 Olympics, Usain Bolt covered 100 metres in a world-record 9.69 seconds. His time through 40 yards — 4.35 seconds. So either several NFL players—and at least one CFLer—are faster over 40 yards than the world’s fastest man on his fastest day, or something strange is happening with 40-yard dash times. Just how did the 40-yard dash become the NFL’s gold standard of speed? One story maintains that former Browns and Bengals owner Paul Brown came up with the test while coaching at Ohio State in the 1940s. Since most punts travelled roughly 40 yards beyond the line of scrimmage, Brown saw value in a player’s ability to cover that distance quickly. Is this guy faster than Usain Bolt? According to another legend, former Cowboys scout Gil Brandt and his staff had grown tired of scouting reports on players timed sprinting over random distances, so they settled on the 40 to establish a consistent standard. Either way, the 40 has evolved into the football world’s most trusted measure of speed, and a standout time can elevate a player to that place where fact meets football folklore. Deion Sanders, for example, is credited with multiple 4.21-second clockings, including one while wearing pads. Former Notre Dame star Raghib (Rocket) Ismail was also timed in 4.21 as an Argos rookie in 1991. And when Bo Jackson auditioned for pro scouts in 1986, they timed him in a searing 4.12 seconds. With several reported sub-4.2 clockings, University of Nevada defensive end Dontay Moch appeared to be the next to enter the pantheon of 40-yard dash legends, but his stats make experts skeptical. Real or fabricated, outlandish times have helped set up a false economy of speed. NFL teams emphasize fast 40s even though players in a game rarely run that far without having to stop or swerve. And they reward fast times in a one-off sprint even though a player has to reproduce top speed for four quarters. NFL player-turned trainer Billy Miller says that in focusing on 40-yard dash times, teams can overlook players who truly are fast. But until scouts concoct a new test to measure speed, Miller will keep training players to “trick the system” — test well in the 40 regardless of whether that speed translates to the game. He estimates 2/10ths of a second in the 40 can vault a skill-position player two rounds in the draft, a distinction worth several million dollars. And players like Turner will continue to benefit from the NFL’s fixation with the 40. “If they’re going to make it their No. 1 test and I do it great, why not run with it?” says Turner, now a member of the Argos. But the phenomenal 40 times of the 1980s and early 1990s didn’t just create a false economy. They also created a false standard, because the times themselves were false. In 1999, the NFL combine switched to a fully automatic timing system in which the clock starts the instant the player crosses the start line and finishes when he crosses 40 yards. Nevertheless, dozens of coaches at the combine insist on timing players by hand, gathering in the stands near the 40-yard line, starting their watches on the player’s first movement and stopping when he crosses the finish line. Those coaches might as well count steamboats. Reacting to a player’s first movement means the clock will always start late, while stopping the clock when he crosses the line is a function of the anticipation and the luck of the person timing. The whole process leaves plenty of room for human error. Track experts accept that hand times aren’t accurate to hundredths of a second, and that timing a sprint by hand will generally produce a result at least 0.2 seconds faster than that same run timed electronically. That means Jackson’s 4.12 was probably closer to 4.3, still top-flight given that no offensive player at this year’s combine ran faster than 4.34. And the 4.21s of Sanders and Ismail were more like 4.4s — equally mind-blowing because they were run on grass. And Turner’s hand-timed 4.31 is now closer to 4.5 seconds, which would still place him within the top 10 running backs at this year’s NFL combine. But in this light, the idea of these players beating Bolt over 40 yards becomes even more dubious. The high school all-stars with 4.3 speed you seem to read about every year? Almost none would run that fast on an electronic timer. And Moch’s time at the combine? Slower than the 4.08 various pre-combine reports credited him with, but the 4.44 he ran Monday is the fastest ever recorded by a defensive lineman. Johnson’s 4.24 is legitimate — electronically timed numbers don’t lie. After the 2009 season, when Johnson led the NFL with 2,006 rushing yards, his agents proposed a 50-yard match race with Bolt to determine the world’s fastest human. Bolt turned down the invitation to a race that might only have measured the yawning gap in raw speed between a 40-yard dasher and an elite sprinter. Greene says players like Johnson and the Eagles’ DeSean Jackson have world-class sprinting ability but simply lack the technique and top-end speed that come with repetition. But doesn’t Johnson still beat Bolt to 40 yards by .11 of a second? 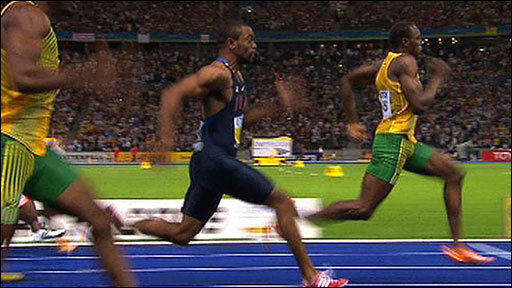 Timing from Bolt’s first movement in Beijing (subtracting his 0.165 reaction time) brings him down down to 4.19. And unlike a football player in running a 40, he’s nowhere near his top speed yet. Focusing on a fast 40 would reduce that time even further, Greene says. And what happens to Johnson beyond 40 yards?